So many whole grains resemble cracked wheat that you might get confused by the variety. 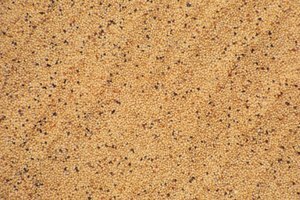 But whether you choose other crushed or broken grains or opt for whole-kernel grains, most of the products work in the same kinds of dishes as cracked wheat, including as breakfast cereals, or in salads; and in stir-fries, soups and casseroles. Different cooking times account for most of the differences among the grains. Any of the grains substitute on a 1-for-1 basis with cracked wheat. Because cracked wheat comes in coarse, medium and fine textures, other wheat substitutes look very similar. Bulgur is cracked wheat that comes already steamed and dried. Like cracked wheat, bulgur comes in different-size grinds but, since it's already cooked, it takes only 10 to 20 minutes to reconstitute, compared with the 20 to 30 minutes for raw, cracked wheat to cook. 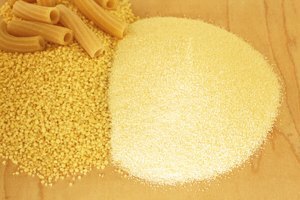 Made from semolina wheat flour, couscous appears in lists of whole grains, although it is actually a pasta, that looks like small bits of grain. 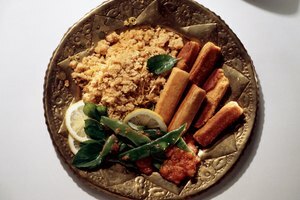 Couscous cooks in 5 to 15 minutes depending on the size. Wheat that comes in whole kernels looks different than cracked wheat, but it has the same nutty flavor as all the wheat grains. Like cracked wheat, wheat berries come from different varieties of wheat, but the whole berries have a more chewy texture than cracked wheat. Another whole berry, from an ancient variety of wheat, kamut is a lighter shade of tan than cracked wheat; unlike cracked wheat, kamut has hints of sweetness along with its nutty flavor. 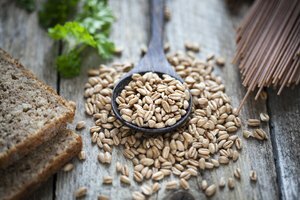 Both wheat berries and kamut take from 60 to 90 minutes to cook, far longer than the cooking time for cracked wheat. If you have allergies to wheat, some other grains fit the bill while still giving you the broken texture of cracked wheat, but with different flavor profiles. 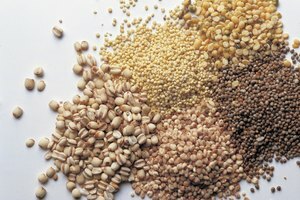 Although the individual pieces of quinoa are smaller than coarse cracked wheat, this grain originally from the Andes is a whole kernel that measures only 1/16 inch. Quinoa has a nutty flavor like cracked wheat, but is lighter in both color and texture, and cooks in slightly less time than cracked wheat, about 20 minutes. Scotch barley is hulled and coarsely ground barley. It's also lighter in color than cracked wheat, is very chewy and takes more time to cook than cracked wheat, about 45 to 50 minutes. Whole-kernel grains all take longer to cook than cracked wheat, but all work equally as well in any dish you would cook with cracked wheat. Brown rice has a similar nutty flavor to cracked wheat, but takes from 40 to 50 minutes to cook. White rice, with the hull removed, and kasha, toasted buckwheat kernels, each cook in about 20 to 30 minutes, just like cracked wheat. White rice is more mild-tasting than cracked wheat, while kasha has a similar, toasty flavor.